In 2001, when we were living in North Carolina, we took Abigail to get her 9 month photos, and they suggested this bath shot. It was so cute, and we thought our little red head was THE most adorable thing, that we said to ourselves - we should do this for ALL of our kids! And I put the photo away until I had a little free time to hang it up. After our move to Ohio, I found a cute-ish bathtub curtain for $4.99 and complimented myself on my thrift as I hung it up in our very first home. Unfortunately, I was on a crisis pregnancy when we moved, so the curtain got left behind. But at only $5, it was worth leaving if it meant trying to get the house to sell. 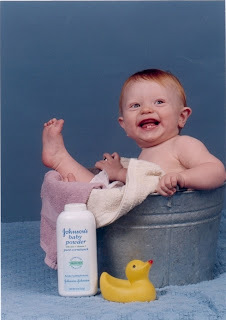 In 2005, when we were living in Nevada, we got our blonde preemie baby - Bear - to a healthy weight, and had his 9 month pictures taken in the tub. We framed the two pictures and started a "duckie" themed bathroom. The shower curtain cost a hefty $12.95, but with a semi- permanent wall border of duckies on blue, it was too cute to pass up! I started trolling the Oriental Trading company for sets of rubber duckies by holiday so I could line them up on the tank. Sometimes the kids would get into them, and I would just have to give a benevolent shake of the head, and say, "Noooooo baby" and then shut the bathroom door. I added a duckie garbage can AND curtain hooks that are in the shape of rubber duckies! I had to take it out of the grocery money, but since I got them at Wal Mart, it wasn't too expensive. 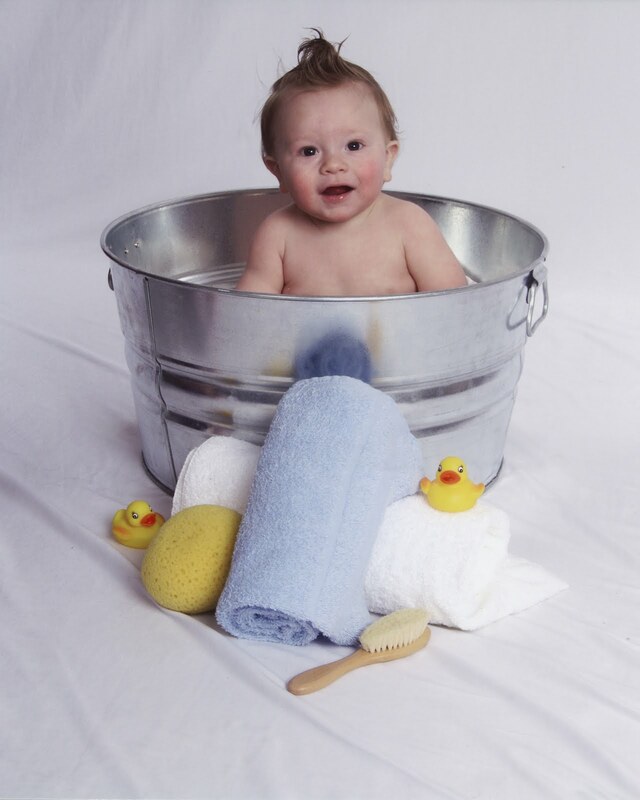 In 2009, when we were living in Arizona, we had Sam's picture taken and he had - BY FAR - the most luscious dark hair ever photographed in a tub. The 20-something photographer had to go to the back and get the galvanized tub and dust it off, but we had mission accomplished! I found a chenille-duck-on-white-broadcloth shower curtain ON SALE for 50% off at $24.50 (it gets even better) PLUS! I had a coupon for an additional 20% the entire order, so I splurged on bright "rubber duckie beak" orange towels. And we got a toothbrush holder, that quacked, for Christmas. Finding a frame to match the other two, however, was a bit of a challenge. I got a semi-match and figured that if you put them on separate walls, no one really looks too hard. Many of the holiday ducks got mold, and were pitched, which was okay since I was getting so annoyed with the toys being dragged out after they had been put properly away after each holiday. 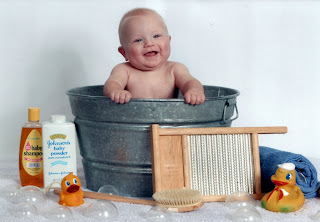 Its 2011, and after 10 years, I just put up Isaiah's 9 month picture in a silver frame that doesn't match anything. Finally. All my children sitting in a galvanized tub with duckies at 9 months old. I had to take the other three pictures to the studio, in Utah, to show the photographer what I was talking about. I guess they don't tend to mess with a mom with a surly 10 yr old, and 3 boys all strapped in and around a stroller who is showing 3 silver framed photos to the "photography hostess." So, with worried and annoyed glances to each other they had to pull the props out of deep storage. 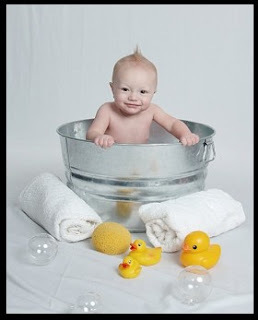 "You see, I have this THEME for our bathroom... and we wanted ALL the kids to have their picture taken at 9 months sitting in the tub with rubber duckies all around!" 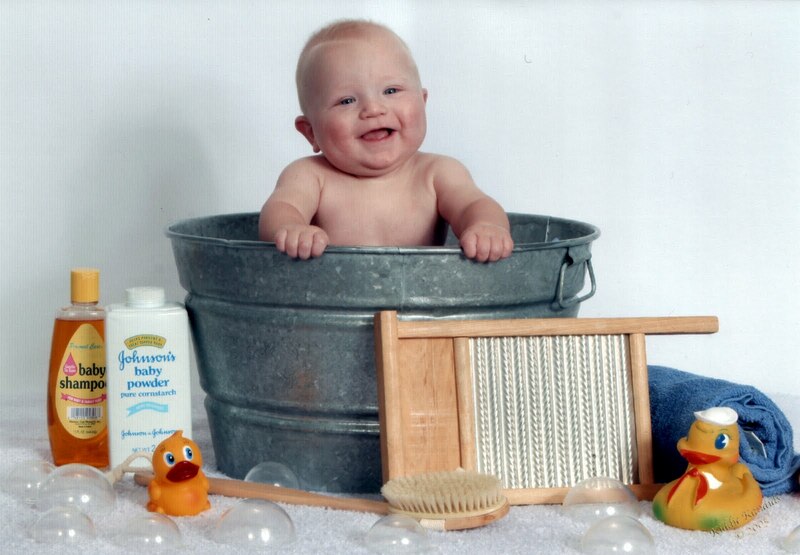 They put the tub down and looked at the photographer with an, "I'm so sorry," glance. Grrrrrr. I'm not being difficult! I'm trying to be ... consistent, fair, equal opportunity or something!!! And it hasn't been easy! The chenille curtain got scissored by "I don't know," which nearly broke my heart. A $50 curtain GONE, from senseless destruction! Little did I know that it was an omen of things to come. So, now we have a plain white waffle curtain - and the bright orange towels are now a dull orange. They have some bleach stains that can be hidden if you fold the towels in thirds and drape each hand towel "just so" over the sagging rod. Unfortunately, they were used to mop up water after a great number of toilet clogging disasters, but since my husband was willing to do it, I didn't complain that he was using my adorable bright orange towels that can no longer be purchased from Linens N' Things because bright orange is now "au tre" in the world of bath fashion! Not everything survives. A few ducks from the curtain hangers have had their heads snapped off, and the garbage can, standing alone with nothing in it REEKED from having too many poopy diapers sitting in it, so it was deemed unusable, oh, I don't know how many states ago! As they were questioning me about positioning and whether to put half bubbles or full pictures, I was screaming in my mind, "JUST. TAKE. THE PICTURE, OKAY!". So, even though Za is 15 months old - I think - we finally got his pic, in a silver frame, up on the wall. It has taken me 10 years to get a matched set. And now, after all that, as I look at my small victory, I realize that I'm kinda sick of rubber duckies. Now, I realize... that maybe I should have had their pictures taken with a surf board instead when they each turned 5. TOO LATE! I LOVE the coordinating pictures...so cute! And fun to see how different they all look at about the same age. You could do a lot of different things with those, even if you're tired of duckies. Just do something basic blue & yellow & white theme. And if you want matching frames but not willing to pay a lot of money, just buy cheap matching frames at the $1 store and spray paint them whatever cute color you want. Don't sell yourself short-- this is a HUGE victory not to mention a sign of a mother who really cares and is doing her darndest. Brava, brava, bravissima!